When you buy a brand new car, it is fitted with factory speakers. More often than not, they are very basic in terms of functionality. For discerning individuals, these speakers may not prove to be sufficient. The sound quality can be inferior. The good news is that you can always have them upgraded. Depending on your budget, you will be able to install high-end speakers. Making a choice, however, is not going to be an easy feat. Given the abundance of the options that are available on the market, make sure to consider the tips that will be mentioned below. One of the most important things that you should do is to consult with what others have to say. The easiest way to do this is to go online and search for the reviews that have been shared by other people. If you are the kind of person who does not easily trust the opinions of strangers, you can ask people you personally know. If you have family, friends, or colleagues who have bought car speakers in the past, ask them for recommendations. Use their insights and experiences to compare your options and to weigh their pros and cons. Without a doubt, budget is going to be an important consideration in your search for the best car speakers. It is tempting to choose the cheapest option that is available on the market, but this is one thing that you can regret in the long-term. At the end of the day, car speakers should be seen as an investment. Spend if you must, especially if this is tantamount into being able to enjoy superior quality. Nonetheless, there are also affordable options that can deliver decent value. You just have to choose carefully. Coaxial Speakers: Also known as full-range speakers, they were first introduced in the 1970s. All of the elements that you need in a speaker are packaged as one, making it beneficial in terms of simplicity. They are preferred by many because they are an option that is perfect for budget-friendly buyers. They also have a direct fit in your car, which means that the installation can be completed in a snap, even if it is done on your own. However, there are problems with regards to their customization as you cannot have them modified as desired. Component Speakers: As the name implies, this type of speaker is composed of different components – subwoofers, woofers, and tweeters. They work hand-in-hand to create superior sound quality. Cables or crossover connections are used to make the audio better. Compared to coaxial speakers, the sound quality is better and there are several enhancements that you can do. This makes it excellent when it comes to customization. Nonetheless, the drawbacks include being more complicated to install and having higher price compared to its counterpart. 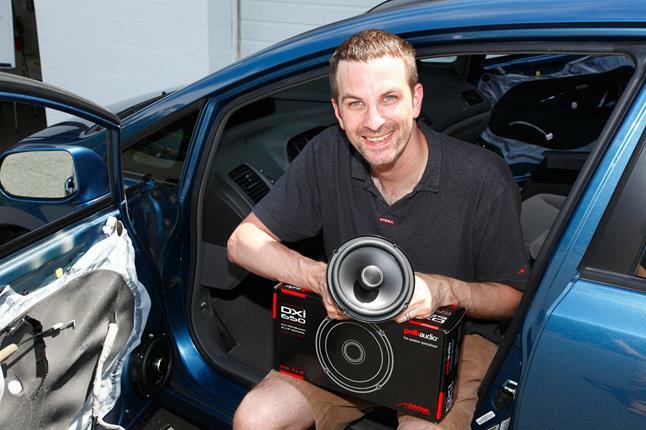 It is important to take note of the fact that not all speakers can be compatible with your car audio. There are generally two important considerations. The first one would be sensitivity, which will be relative to the power that will be applied into the speakers. If your car stereo is low powered, which is common for factory-installed sound systems, you should pick speakers that have high-sensitivity ratings. On the other hand, if you have a high-powered system, the speakers should have low sensitivity. The second factor that should be taken into account would be power handling. You should know how much power the speaker will be able to handle. For low-powered audio systems, you do not need a speaker with too much power. In the case of high-powered audio systems, however, the speaker should be equally powerful. Otherwise, sound can be distorted and it will be inferior. The materials are important not only for aesthetics, but also because of their impact on sound quality and durability. Different components of the speaker system can be made from varying materials. For the woofer, it is important for such to be made from stiff and light material, such as polypropylene. This can ensure excellent production of bass sounds. For the tweeter, on the other hand, silk, polyurethane, and other soft materials will prove to be the best. They can help increase the warmth of the sound. If you love listening to higher tones, on the other hand, ceramic or metal tweeter can be a better alternative. For the surround or casing material, choose one that is tough enough to withstand many years of use. Make sure that it can also handle humidity and heat so that sound quality will not be affected. Rubber is a highly-recommended material for the surround.